Two research groups won national awards at the Canadian Association of Physical Medicine and Rehabilitation’s national conference. 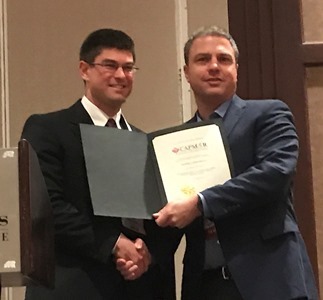 Dr. Mark Campbell and his team won paper of the year* for the first study to show that the mesenchymal stem cells (MSCs) of patients with osteoarthritis are different in the relatively healthy parts of the bone compared to those in the disease-related bone marrow lesions (BMLs). These differences included changes in gene expression of MSCs in the BMLs that could lead to further bone damage. These findings, published in Arthritis & Rheumatology, could inform therapies to repair early stages of osteoarthritis. Drs. Alison Anton and Nancy Dudek won best poster** for showing that a high-level mobility assessment tool initially developed for the military (the Comprehensive High-level Activity Mobility Predictor), is valid and feasible for evaluating active patients with lower limb amputations. By assessing agility, higher speed mobility and directional change, this tool provides more information than traditional tools that only look at walking on level ground. * Authors: T. Mark Campbell, Sarah M. Churchman, Alejandro Gomez, Dennis McGonagle, Philip G. Conaghan, Frederique Ponchel, Elena Jones. Funding: Innovative Medicines Initiative (BTCure), Wellcome Trust, NIHR Leeds Musculoskeletal and Biomedical Research Unit.